I have three separate story starts labeled WEP BRIDGES in My Documents. At the last moment (well, over the last few days of looming deadline) these two little boys nudged their story into my wandering attention as I listened to a book I lost interest in during a looooong drive. I kept telling the kids I already had a story start for this challenge, but when I opened the story I decided to finish and post - this is what actually/eventually got written. You know how demanding children can be sometimes? If not, you know how demanding ignored characters can be? Its been through three days worth (intermittently) of editing, deletions and revisions; to the point I'm not sure I even see it anymore. All that for a thousand word flash!?! I should be this dedicated to my novel writing, lol. 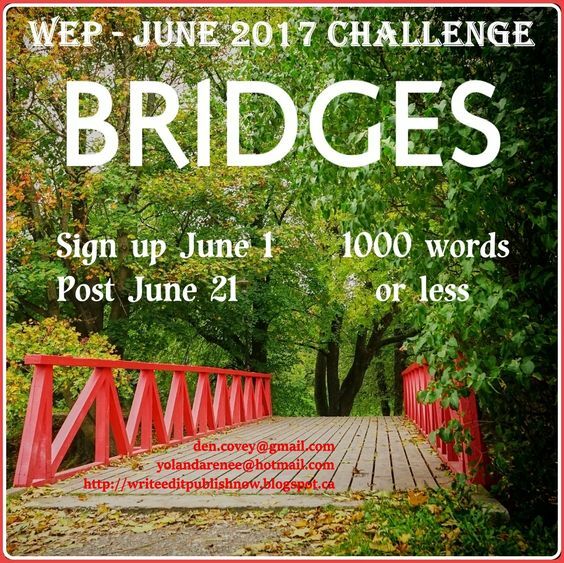 Below is my 996 word contribution to Write..Edit..Publish BRIDGES challenge. Click here for details on the challenge, links to other participants, and to meet and greet the WEP hosts. Jack and Carl huddled together in Carl’s bedroom closet. Jack cradled his six year old brother as their father’s tirade beat through the downstairs rooms. Their mother screamed and cried. Carl whimpered with each crash and curse. Jack cursed and hugged his brother tighter. Aaron wanted to say something, encourage Carl to get out. He’d shown Carl where he would be safe. But Carl couldn’t hear Aaron when anyone else was around. Their mother’s screams abruptly ended. Jack’s whimpers rivaled Carl’s in the sudden silence. Aaron tried again to contact Carl. He advanced through the bunched clothing and knelt among the mismatched shoes. He merged one hand with Carl’s, and in desperation and fear, laid a hand on Jack’s shoulder. “Run where?” Jack asked, leaning back in surprise. “And Jack?” Carl removed his hands from his head and looked directly at Aaron. The door to Jack’s bedroom crashed against the wall of Carl’s closet and both boys screeched in terror. They could hear their father still searching Jack’s room. Carl stepped over Jack and pushed open the closet door. He grabbed Jack’s arm and tried to get him on his feet. Aaron was at the bedroom window beckoning them to hurry. “No!” Aaron and Carl said together. “Please Jack,” Carl echoed from the window. “Jack!” Their father called from the hallway. "That deadbolt won't hold for long," Aaron warned. “Help me Carl,” Jack said as he ran to the dresser. Carl raced silently across the carpet in his bare feet and helped Jack teeter-push the four foot tall dresser towards the door. Then the banging sounded, the door almost caved in, and Jack ran around to Carl’s end. He bent down and tried to lift the dresser. Seeing what Jack intended, Carl also bent down and added his weight to the lift. The dresser toppled and they shoved it in front of the door just as another crash nearly buckled the door off its hinges. “Hurry,” Aaron yelled from outside the window. Jack lifted the lamp off the nightstand and aimed it at the window. His window was nailed shut; but Carl rushed to the window and unlocked the latch. “Open this door NOW,” their Dad yelled. Jack dropped the lamp as a fist sized hole burst through the door. He ran to the window as Carl scrambled out onto the roof of the porch. “I won’t go without Jack,” Carl yelled. “Like this,” Carl said. He hung onto the gutter, then swung his legs over and disappeared. Jack leaned over the edge, scared his brother had fallen. But Carl was shimmying down the post and was nearly to the ground. Jack saw the flash of blue and red Spider Man pj’s as his brother disappeared through a missing slat in the wood fence. He looked back as his step father crashed through the bedroom door. Carl was safe for now, but he might still be able to save their mother if he could get to a phone. Jack swung easily over the edge and wrapped his legs around the pole. "Little creep, stop right there," his step father yelled, leaning over the gutter. Jack screamed and slid down the pole, his hands and forearms stinging from splinters. He let go and let himself drop half way down. He heard more cursing and crashing of furniture as his father thudded back into the bedroom. It wouldn't take him long to get down the stairs. Jack ran to the front door and twisted the knob. It was locked. He shook the handle and banged on the door but it wouldn't budge. Giving up, he turned and sprinted for the hole in the fence. He ran down the wooded path towards the ancient oak tree, barely noticing the sharp rocks digging into his bare feet. He and his friends had traded stories about this area, but Jack had never seen anything weird. Seeing his brother’s imaginary friend made him rethink the impossible. Ahead, he could hear Carl calling his name. Rainbow lights filtered through the leaves, and the sound of music and laughter. He burst through the trees and shaded his eyes against the brightness. Carl was in the center of the rainbow, smiling. He waved at Jack as he slowly disappeared into the lights. Jack hesitated, torn between rescuing his mother or following his brother. He glanced behind him, then turned back to tell Carl to wait. Aaron and the magic had disappeared also. 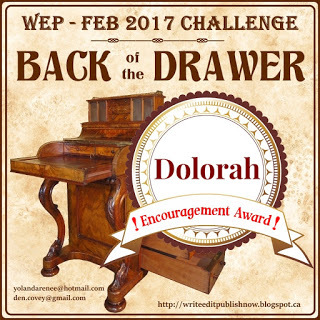 If this writing inspired you to undertake some prompt writing of your own, please visit the WEP Upcoming Challenges page to plan your future participation. IWSG: ARE YOU A QUITTER? Guess this is as good a day as any to remember to blog. 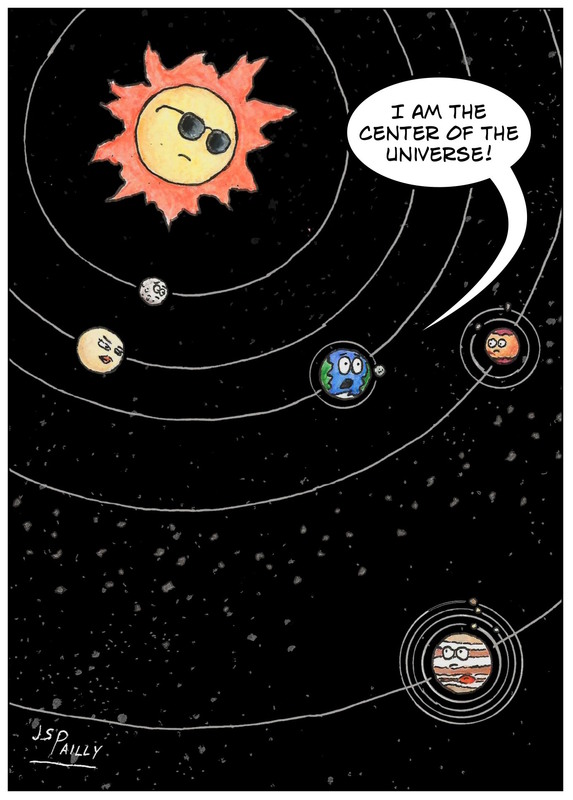 With the warmer weather its hard to be sitting inside on the computer while everyone is out swimming, hiking, or generally soaking up the sun. Not me though. I'm a white girl! And I don't mean that just racially (sorry if you are offended); my well developed summer tan looks like most people's winter pale. My skin will burn to the point of blisters if I leave my shade too long. To the dismay of most of my family, I quit sunbathing for the sake of social acceptance a very long time ago. I do allow myself to pink-up for walks in the park or woods, small amounts of yard work, and the occasional swim in a back yard pool. Everybody needs a bit of summer fun - even me. So how is the writing going for you this time of year? 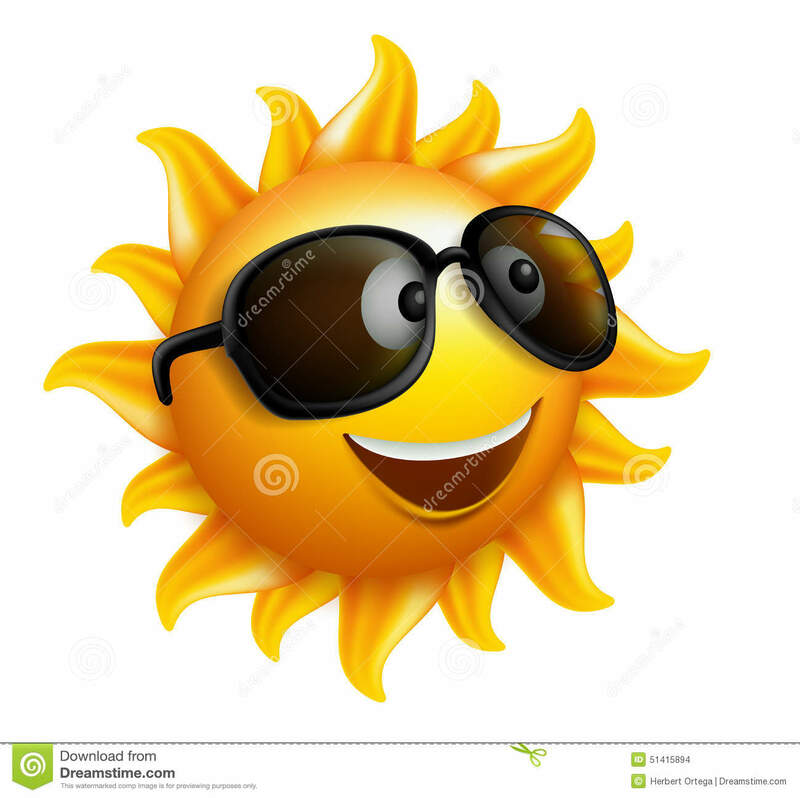 Do you have to modify your writing time to catch early morning or early evening coolness? Or to work around kids, partners, or other's vacations? Or do you simply QUIT writing for the summer and save yourself the frustration? This month's IWSG question: Did you ever say “I quit”? If so, what happened to make you come back to writing? Well yes, I have said "I QUIT!" and meant it. Like a smoker (or any other addiction), I did quit writing - well, quit writing on my books and short stories. For about three years, or less. I was writing blog posts, and comments, and even started a SOP at the day job.I wrote emails - like really long ones - and critiques for writing partners, and quite a lot of book reviews. Even wrote some story starts. So I have quit writing. And came back. And quit again. Repeat. One of the things that bring me back to writing is a thought provoking question that has surfaced several times over my blogging/writing career and goes something like: if I'm not actively writing, can I still call myself a writer (author)? The question terrorized my guilt for a few months, which is probably when a good many of those story starts smeared a word document. I did not agonize over it for long however. I realized that many famous celebrities are not "actively" participating in their professions either. 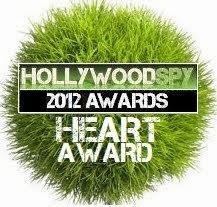 Athletes, actors, singers, musicians, models. And even some writers. When I took the pressure off myself to produce non-stop, I again found my enjoyment in the craft of creating stories. Of spending time letting the voices in my head out onto the page. I would still be a writer even if I was never published. 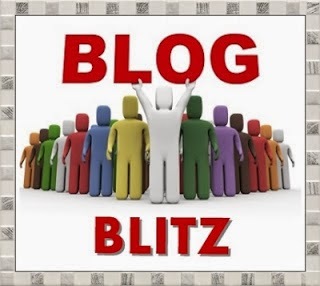 I will still be a writer even if all I ever produce is flash fiction for blogfest prompts. Having my short stories published occasionally is AWESOME as incentive to continue to write. And I still pull out my story starts and the trilogy and do some serious writing/editing. I do hope one day to be a famous author and have my books sitting there next to Stephen King, Joy Fielding, Jodi Piccoult. But writing is a hobby, and I doubt I will ever QUIT forever. I enjoy it too much. Even when I hate it. 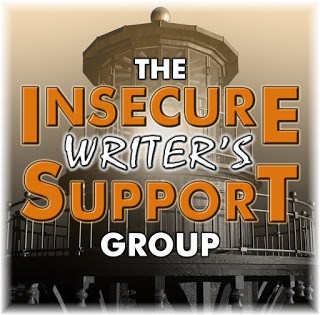 If you are new to the Insecure Writers Support Group click here for the details on this once monthly blog hop. 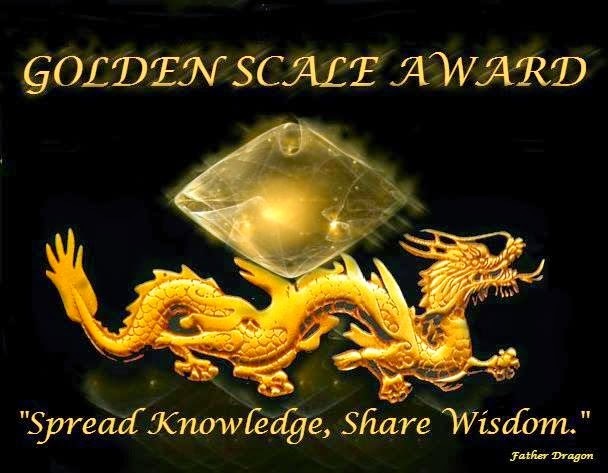 You can visit other participants and sign up on the list if interested in participating yourself. Be sure to thank our host Alex Cavanaugh, and June's co-hosts JH Moncrieff, Madeline Mora-Summonte, Jen Chandler, Megan Morgan, and Gwen Gardner.